Yesterday I received a call from the Multicare Bereavement lady. She has called a couple of times now just to check on us. She asked about all of us and how we are doing. I told her I thought Scott was doing better in the last couple of weeks but I found later I was wrong. As I was filling the watering can, Scott came out through the carport with tears in his eyes. He cried and said, “I miss Kathryn so much.” I just hugged him, as we need to do more often. Of course then I started crying. I told her that the days are up and down. One day you’re ok and the next you can’t even move. Getting through a day can be a challenge. She asked about Richard. I told her he doesn’t talk about it at all. Not to anyone. She asked if he had someone to talk to and I said he could talk to his girlfriend who also lost her sister to brain cancer. He could talk to anyone from camp and of course he could talk to me. She mentioned that sometimes people try to protect others and I knew exactly what she was saying. Both of my children of my try to protect me. Kathryn tried to keep me from mental pain by always having her smile and positive attitude. Richard checks on us daily to make sure we are doing ok. He’s such a good man. I’m so proud of him. He’s doing his best to keep from being depressed and thinking about his loss. The two of them were so close. Today is the fourth of July. We are going to Cody’s Grandma and Grandpa’s house. We having been going there now for four or five years. Cody is Kathryn’s best friend from way back in middle school. So this afternoon is all because of Kathryn. 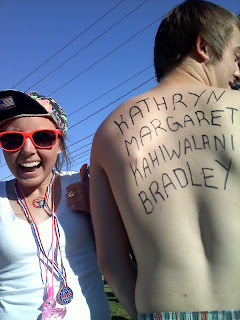 Last year she wrote her entire name on Cody’s back. I’ve posted the picture. You can see how well she was doing. We had a great day. Today may be a little hard to handle without her there but we will see. We always come home for our own fireworks, as we will this year too. Scott mentioned last night that he would always buy the special little fireworks for Kathryn. She liked the tanks, blooming flowers, fountains, Parachutes, sparklers, roman candles, and on and on. Just trying out all those little things in the family pack is what she liked. Richard called this morning. He is going paddling with Lucas today. I’m going to take a long walk this morning. The scale read 1 ½ pounds more so it is time to get serious. We’ll head out at 1:00 to watch the air show and hangout with our friends. Then we will come home around 6:00 to hang out with our neighbors and then do some fireworks. The friends whose house we went to during the day had set up a little memorial for Kathryn. A bouquet of bright flowers, a couple of bright beanie baby bears, a beanie baby panda and the picture from last years fourth that I posted in a frame and a 8 by 10. I was surprised and very happy. It’s so nice when people show how much they love Kathryn. It’s wonderful that they have honored her this way. We had a great time there. Kathryn had brought the sun for us so it was perfect. Now here comes the interesting part of the night. While we were watching our own fireworks show, which very outrageous, my neighbor starts telling us about the ghost in their house. She says she never believed in this stuff but now that it has been thrown in her face she has to believe. This ghost has done things with the lights, the garage door, knocked on the doors, beds and even touched her and her oldest daughter gently on the hips. They have all seen this ghost too. The ghost is a girl a little smaller than the oldest daughter (who is just slightly taller than Kathryn and slender). The ghost is blond with shoulder length hair. The ghost started to show up around February and is friendly. Oh my, we all looked at each other and realized it must be Kathryn. I really think it is Kathryn. Why would she be there I’m not sure but I do know that we all adore the little girls in that family. They actually see her. I wish she would come to our house so I could see her.